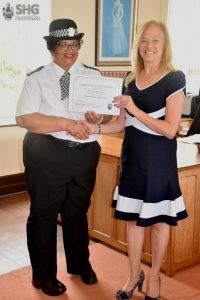 On Friday, 22 September 2017, four Officers of the St Helena Police Service were presented with certificates having successfully completing a six-week St Helena Police Training Course. 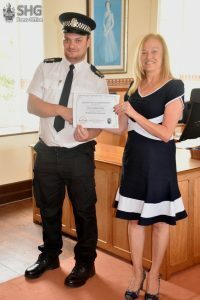 The Police Constables – Carol Youde, Jonathan Clark, Sophie Crowie, and Tyler Legg – were presented with certificates by Governor Lisa Phillips in her office in the presence of colleagues, family and friends. Governor Lisa told the officers that they had done a great job in their training and would now have a greater capability to implement the skills they have learned out in the field.